We live in a great place governed by good people. Not just the people with titles and name-plates, but also the dozens of staff members who give up their nights to engage, listen, and respond. I was thinking that at last night's Work Session. In many other places (I would even say most), capital projects are something you are witness to. They are included in a budget, hard hats show up on Main Street, and the community guesses at what things will look like once the jack-hammers and paint brushes are put away. Here, and particularly over the past four years or so, we have the opportunity to participate in the process, receive advanced notice, and even redirect projects that may be off-line with community need. 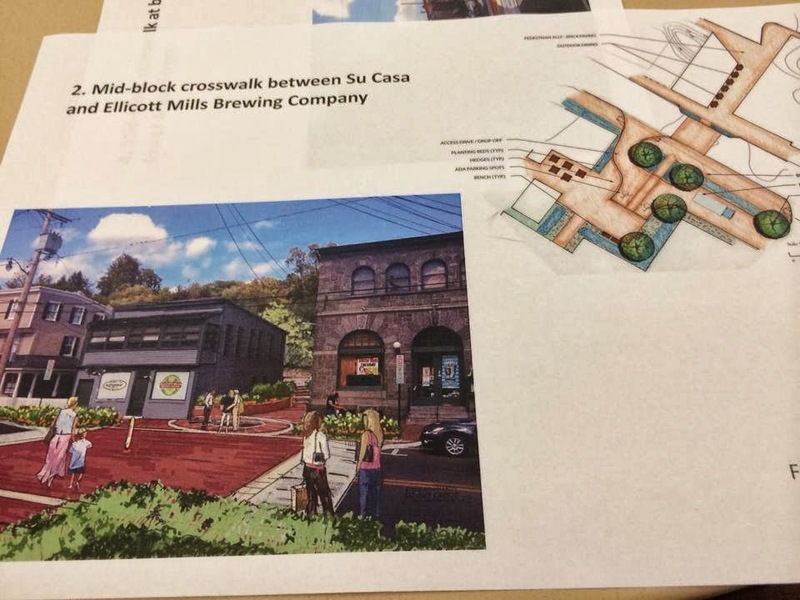 Project 1 plans a welcoming "entrance" to town that is meant to communicate that "this is a place for people" (i.e., look out for pedestrians). A similar project is planned for the bottom of the street in Project 5. As you can see, it also involves beautification of the street corner to make a small park. The mixed-use development behind this project is a clear distraction from the foreground proposals, but those efforts are already underway. Project 2 will create a new crosswalk at Ellicott Mills Brewing Company, linking the La Palapa/Su Casa side with Lot E. You'll see that the consultant projected outdoor dining at Ellicott Mills, which is not part of the project, but was offered to give an idea of what this space may look like. Project 3 shortens the distance of crosswalk on Old Columbia Pike in response to numerous concerns that cars come through that intersection too fast and the current crosswalk is far too long. A few attendees suggested that this would make traffic backed up from this intersection even worse, to which other attendees responded that pedestrian safety should trump traffic concerns. Project 4 suggests a crosswalk at "the bend" in Main Street (right near Work Play Bark). 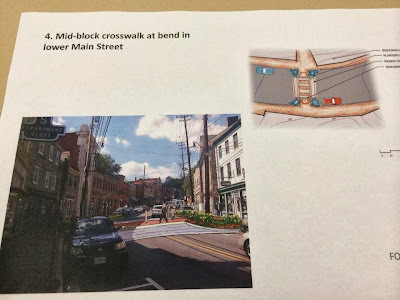 This is in response to the complaint that there are not enough opportunities to cross Main Street. 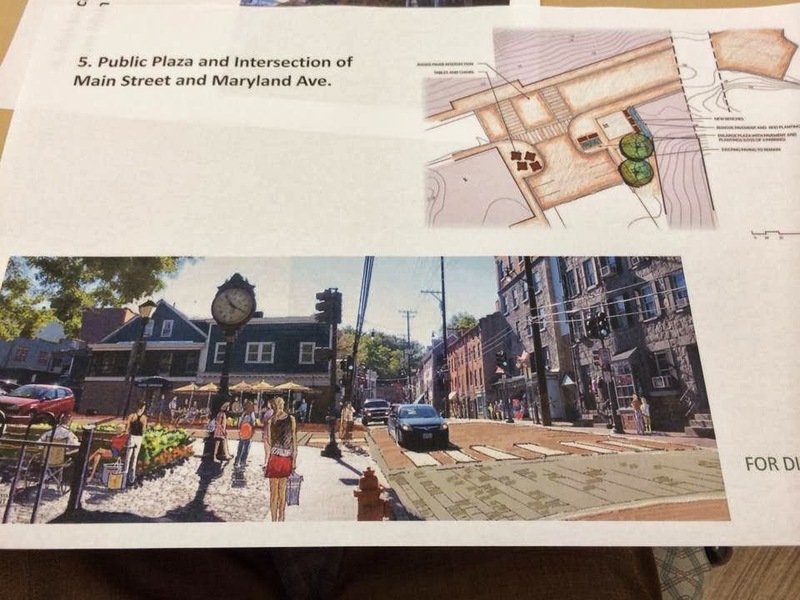 Project 5 extends bump-out patio areas into what are now parking spots and creates another "entrance point" for Main Street, again intended to communicate that this is a place for pedestrians. I had the opportunity to sit with some residents from the West End of Main Street, where some of the worst flooding from Tropical Storm Lee occurred. They had drafted a petition seeking capital improvement funds to go towards flood mitigation and even posted a competing "Project" for attendees to vote on at the work session. I don't think Ellicott City needs to choose between beautification and flood mitigation. 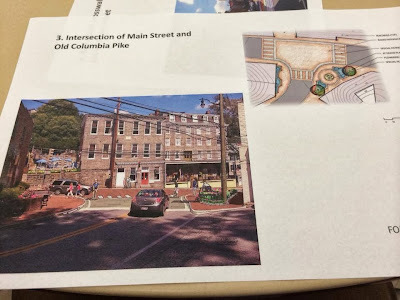 That may have been true 10 years ago, but in 2013 Main Street Ellicott City has been made a priority by both the County Executive and our County Council representative Courtney Watson. I have been particularly impressed by Courtney's dedication to flood mitigation efforts and have seen her, or someone from her office, at every meeting on the subject, whether it be storm water, flood solutions, or capital projects. But let's reject the adversary paradigm. We can walk and chew gum. Community projects like these have momentum to them. We need to keep the pressure on to provide concrete solutions to flooding. That is without question. But we're playing into a bad game if we attack these projects for the sake of promoting different ones. We will soon hear from a different set of detractors who will then pit those projects against others and we continue down this path until everyone is angry, tired, and wet. 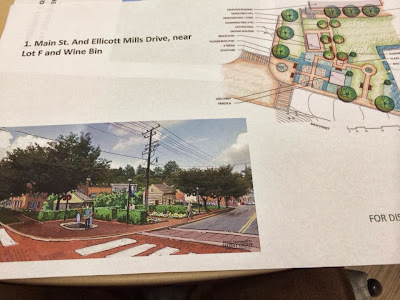 For now, let's look at the proposed projects to make Ellicott City more beautiful, more user friendly, and more safe. Then we can ask "What's next?" Have a great Friday doing what you love!